a dedicated space with high quality materials for children to explore through a range of creative media. I am a Brazilian artist with a diversified background. Although I have also studied architecture, my Bachelor's degree is in Fine Arts. During my studies, my work focused mainly on transforming public spaces; installations and work with natural elements, especially water and soil. current working within the forest school environment in South East England. I have been working with children for more than ten years now and have taken many different approaches like technology atelier and forest school. I identify myself a lot with Reggio Emilia's pedagogy regarding self guidance, using open ended materials and playful activities. I’m an adventure person, have always loved outdoors activities such as travelling, cycling and camping and I have now been practicing yoga for six years. I believe it is very important to keep art and nature close to children to learn from its powerful wisdom, their effortless flair to be so natural. I am a Brighton based artist with 10 years experience working as a freelance artist educator. I have worked internationally with a range of museums, galleries, schools and nurseries helping design and facilitate specialist art education programs. I have experience organising public art events and exhibitions for a variety of arts institutions including Saatchi Gallery and Sadler’s Wells most recently. I completed my Fine Arts degree at Goldsmiths University and later went on to complete my Masters in Art and Design in Education at UCL. 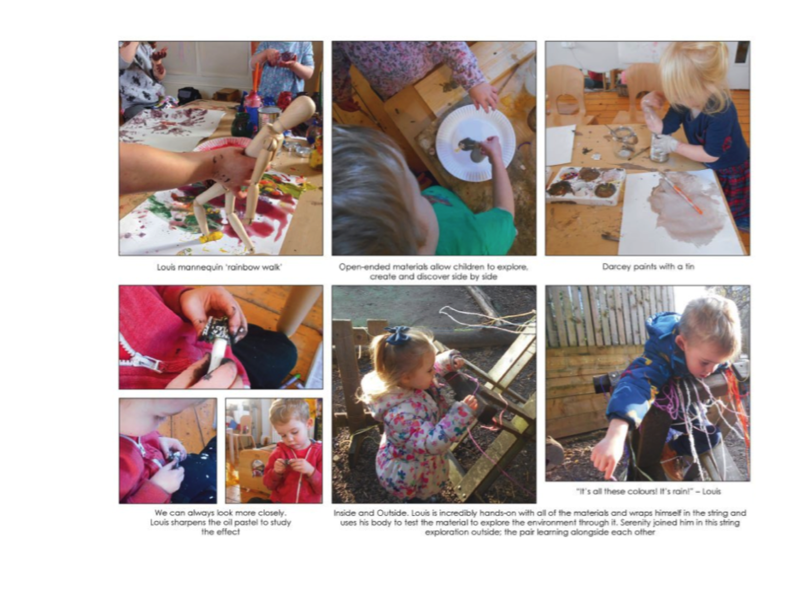 My research helped me understand the relationship between my art practice and education practise, it was at this time I was introduced to the Reggio Emilia approach. I see my practice working with children as a collaborative process where both parties need each other for inspiration to move projects and ideas forward.